I ended my last blog by introducing the New Zealand term for a traditional classroom–single-cell. The adjective evokes images of isolation for a teacher. For the learner, if the teacher/student match is positive it isn’t so bad. On the other hand, we’ve all had that teacher in our lives, the one with whom we’ve spent a year feeling like we’ve been sentenced to jail, stifled by the lack of creative expression or extreme power differential that makes taking a restroom break an act of piracy. As a parent, I’ve waited with baited breath for the class lists to get posted the Friday before the start of the school year, praying my girls would be matched with the right teacher for their learner dispositions because single-cell is just what it sounds like for the most part—a school year sentence to a single space with a single teacher. New Zealand’s ministry of education is moving away from that industrial-age concept. I’ll elaborate on how they are doing this as I describe our visit to Glen Eden Intermediate School. An intermediate school in New Zealand is akin to a middle school in the US. Intermediates are quite unusual in the country. Glen Eden houses 1,046 Level 7 and 8 learners (think Grades 6 and 7 in the US)! The school doesn’t look very different from schools I’ve taught in or visited in southern California. Indoor hallways are nonexistent. Buildings are sprawled out over the landscape and connected by sidewalks with a few covered pathways. Single-cell classroom structures are interspersed with open, flexible learning spaces. It is a lot of ground to cover to supervise so many 11-13 year olds. And yet, like the other schools we visited in New Zealand, it is different. Supervision has a different meaning when learners are self-directed and self-managing. The school’s vision is an Engaging environment full of opportunities and choice. Where students are invited to create your future with us. Their strategic goals revolve around Empowering learners for their future. This means students are expected to live out their school values regardless of where they are on the school campus or the level of supervision at any given time. 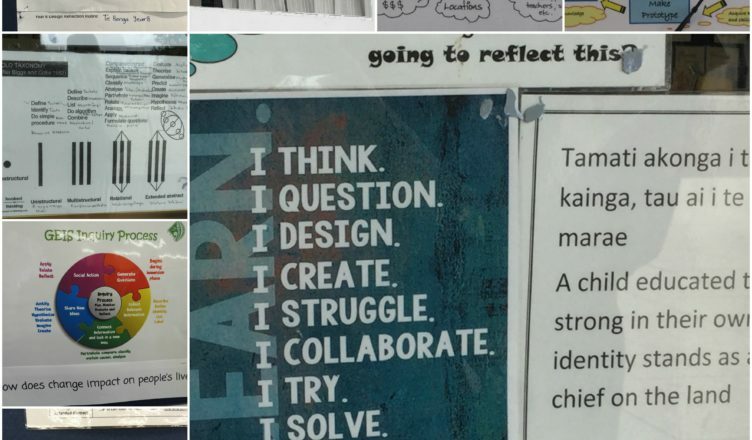 Those values— Respect, Resilience, Excellence, Integrity–are communicated in formal and informal visuals throughout the school. Powerful learning requires Powerful inquiry which means teachers inquire into the effectiveness of their own practice as individuals, as teams, and as a school community. Students also engage in powerful inquiry. They get explicit opportunities to inquire into their interests and passions during their school week. Powerful connections refers to the school’s commitment to their larger community and the unique placement of Glen Eden as a stepping stone in children’s transition from primary to secondary education in their community. 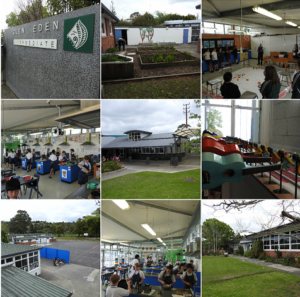 It is a journey for the staff and the students that they must view holistically across the community because Glen Eden receives 500 new students a year from a number of smaller schools. And, each year 500 students are moving on to secondary school. The staff get two short years to build a community of learners. 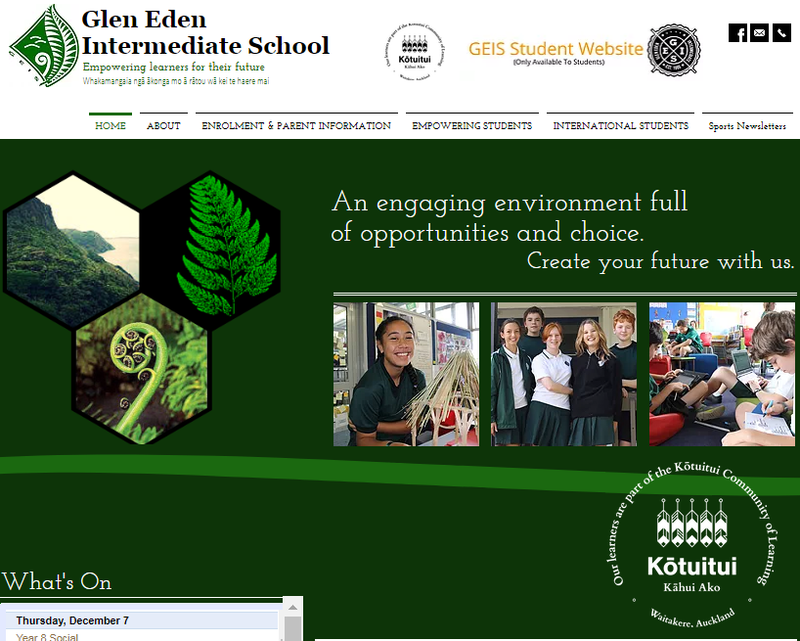 It is also why Glen Eden is part of the Kōtuitui Community of Learning. 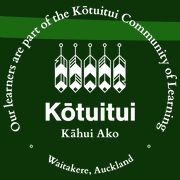 Kōtuitui is a Māori word that means to interlace, interlink, or connect. 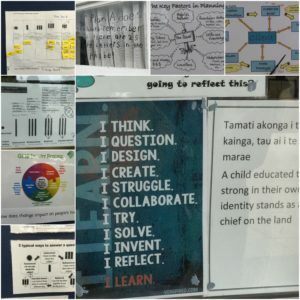 Twelve schools in the Kōtuitui commit to a collaborative learning community to lift aspirations and raise the achievement of every learner in the community. They work together to connect across schools to smooth transitions from one learning community to the next. Glen Eden helps learners build powerful connections in the short time they spend in intermediate school. They do this by creating mini-schools within the larger school. Each mini-school has a teacher who serves as an assistant principal as well as other leaders who help distribute the leadership load. Glen Eden is a school in transition from single cell classrooms to modern learning environments (collaborative, flexible learning spaces) and we saw evidence of this transition on our visit. The challenges teachers expressed about the transition were not unlike the struggles we hear from innovative schools in the US. Their top challenges are making pedagogy consistent, future-focused, and not dependent upon the learning space (single-cell or modern, flexible spaces) or mini-school within the larger school setting. As in the previous schools we visited, Glen Eden uses its own language of learning to address the challenge of consistency and future-focused pedagogy, and their language draws upon research that supports powerful learning. Glen Eden uses the learning language embedded in SOLO (Structure of Observed Learning Outcomes) to help students gain agency. The staff adopted this model of learning to help all learners in the school develop a common language of learning. Visuals throughout the school remind learners to use their language of learning to actively learn. They equip students to own their learning and celebrate with them when they do. Their early efforts started with inquiry learning and they have been moving forward with it a step at a time. Teachers learn to question in ways that encourage student inquiry and share tools for inquiry such as research steps and social action processes. 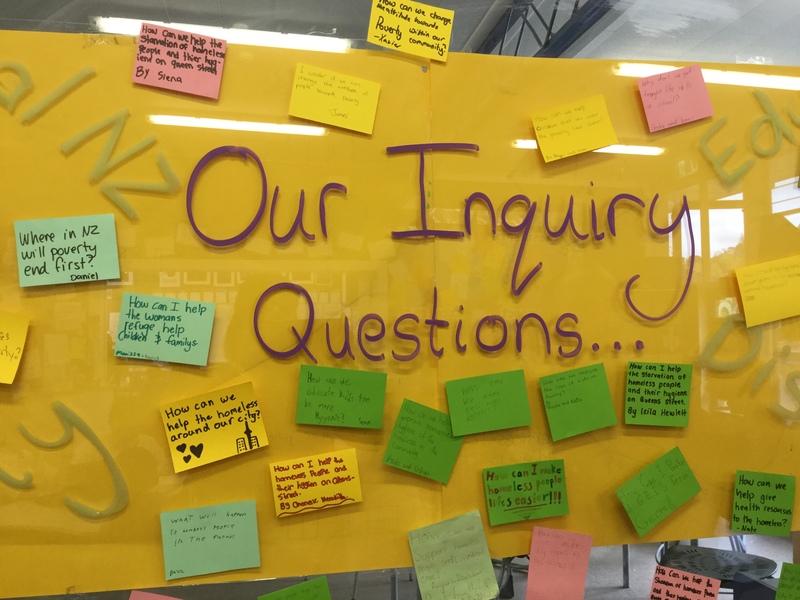 Teachers at Glen Eden believe their role is to build wonderment and curiosity and to put more power for learning in the hands of the learner rather than the teacher. Creative flourishes in adversity. Learning should be surprising, unpredictable, unsettling, challenging, provocative, extended connections. Those statements sound about right for a school full of 11-13 year olds learning to be active agents of their own learning, don’t you think?